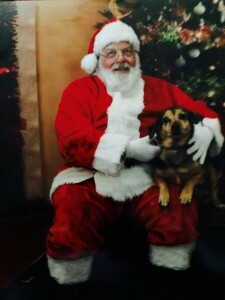 No words are necessary to explain the following photo. 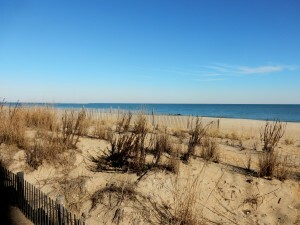 It has been warm at the Delaware Beaches and it is the end of December!! 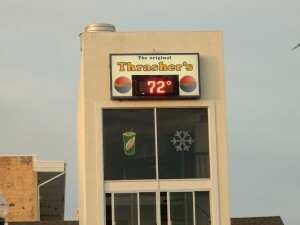 Thrashers French Fries with Salt & Vinegar. 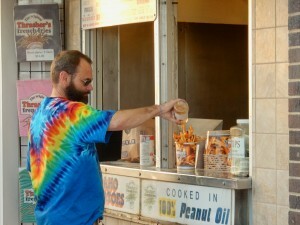 The best grub on the Boardwalk. 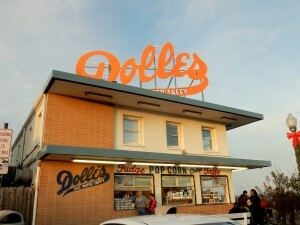 On the corner Dolle’s was also open selling what they have been selling for years, popcorn and taffy among other favorites. On Rt. 1 the outlets were packed and the highway was definitely busy. 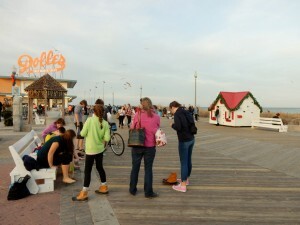 In Downtown Rehoboth Beach it was like any other summer day at the beach, except that even though people were wearing shorts and short sleeve shirts, I did not see any bathing suits. 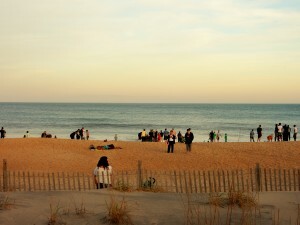 Other than that people were on the beach, walking the Boardwalk, pets were out, and life was good today. 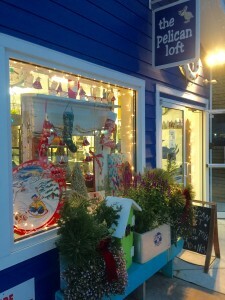 First Place was The Pelican Loft located at 143 Rehoboth Avenue. 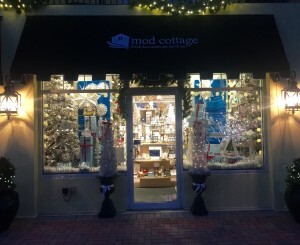 Second Place was Mod Cottage located at 246-A Rehoboth Avenue. 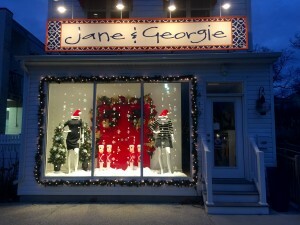 And Third Place was Jane & Georgie, located at 419 Rehoboth Avenue. 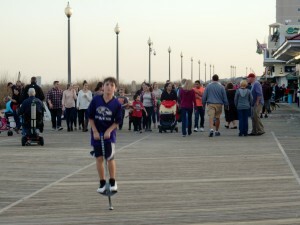 Walking the Boardwalk is a past time that residents of Rehoboth Beach love to do. 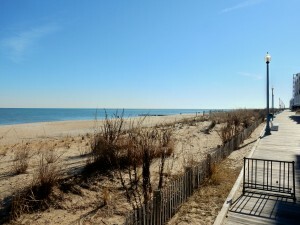 The Boardwalk is one mile long. It is relaxing any time during the day, but I do like it towards the end of the day. Meeting Sharon was a surprised so we kept on walking. Felt soooo good. 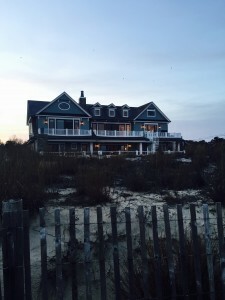 Love to see that owners are enjoying the homes at the beach. 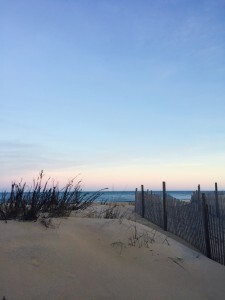 This is a great time for Rehoboth Beach and New Year’s will be again crowded. 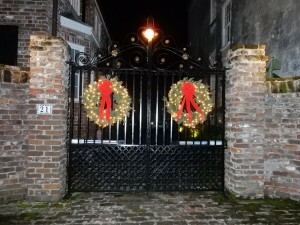 The fun part of staying in Historic Charleston is that you can walk everywhere. 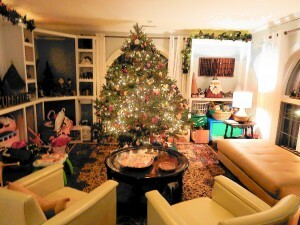 During my stay last week I noticed that Christmas decorations were very traditional and understated. So en route to Husk at 76 Queen St. I was. 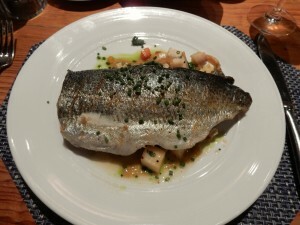 I was anticipating a very nice dinner. 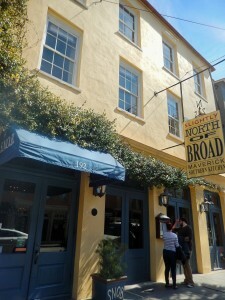 This is one of the top restaurants in Historic Charleston. Tel. 843-577-2500. You can find it on Facebook. Website? 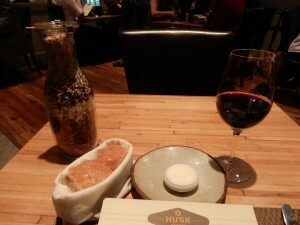 http:/www.huskrestaurant.com. 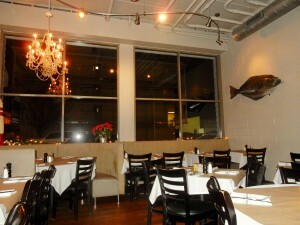 Husk is operated and managed by the Neighborhood Dining Group. You can find this group managing and operating restaurants throughout the southeast. 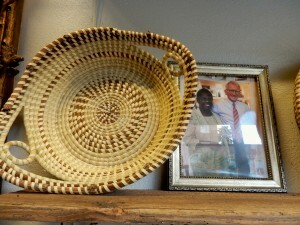 For more info., please visit http://www.neighborhooddininggroup.com. 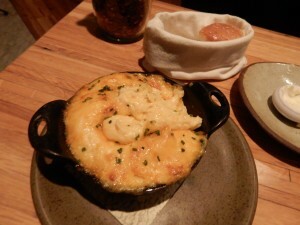 Husk opens 7 days a week. Lunch is served Monday through Saturday from 11:30 a.m. until 2:30 p.m. Sunday Brunch is from 10:00 a.m. until 2:30 p.m. Dinner is from Sunday to Thursday from 5:30 p.m. until 10:00 p.m. And, Friday and Saturday dinner is from 5:30 p.m. until 11:00 p.m.
Wednesday evening was crowded so my photos were limited to my dining experience. 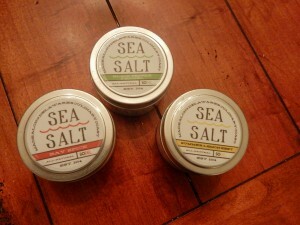 The bread was sprinkled with sea salt. 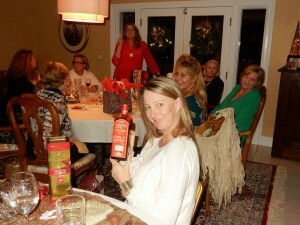 It was brought to the table promptly. The service from this point on was impeccable. 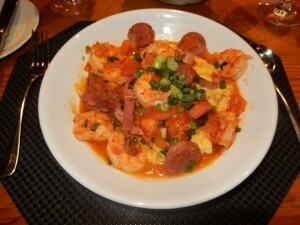 Through my stay in Charleston I always asked for the signature dish of the restaurant. I figured it is one that is tried and true and really liked by the public. So I started with Kentuckyaki Glazed Pig’s Ear Lettuce Wraps, Sweet Vinegar Marinated Cucumber, Red Onion and Bourbon Barrel Togarashi. Togarashi is the Japanese word for red chili peppers and a general name for a group of condiments that blend chili pepper with other ingredients. 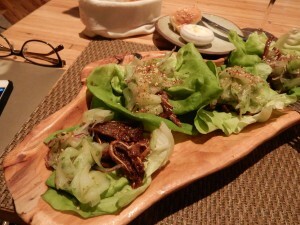 The pig’s ears were thinly sliced and were crisped. The cucumbers were all preserved by Husk as they usually do with all their summer veggies. 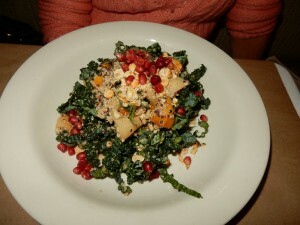 This dish was awesome. 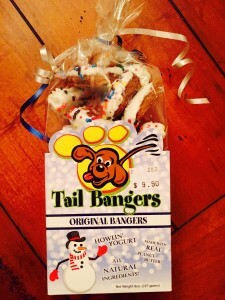 And when upon posting the photo on Facebook my friend, Shelley, mentioned….Oh you could get those at Southern States….she seems to still have a good sense of humor. 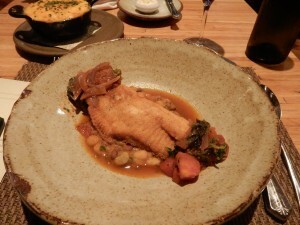 Another Signature Dish at Husk is the Cornmeal Dusted Carolina Catfish. Field Peas and Butterbeans, Smoked Tomato Gravy, Mustard Greens. 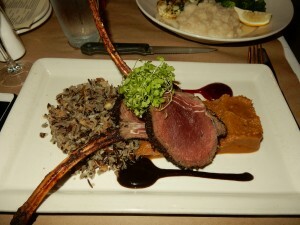 Once again the flavors on this entree were terrific. 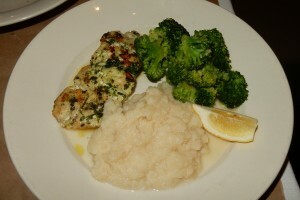 I also enjoyed this dish because I knew my late husband, John, would have ordered it, as well. This Catfish had a bit of a bite to it even though the flavor was mild and the dusting was light. My dessert was again decadent. 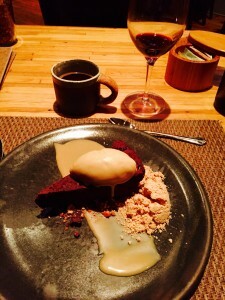 Olive & Sinclair Chocolate Fudge Cake with homemade Peanut Butter Ice Cream and a dusting of peanut butter powder. 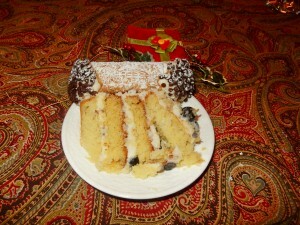 I missed my partners in crime to help eat this cake, so what can I say, I ate it all myself. Olive & Sinclair chocolate is stone ground in Nashville Tennessee. More information, please visit http://www.oliveandsinclair.com. 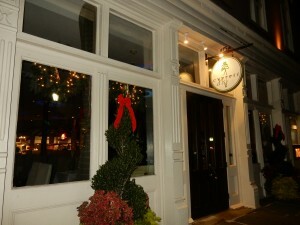 So, 3 nights in Historic Charleston, 3 delicious dinners, 2 great breakfasts, and 1 very nice lunch…..TTYL Have Good One!! A glass or two of wine with friends is one of life’s greatest pleasures. 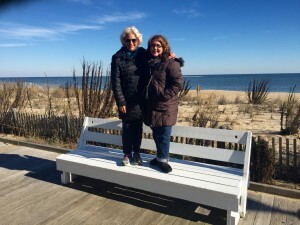 The Swirl Girls started in Ocean City, Maryland, almost 6 years ago by a group of friends that enjoy wines. 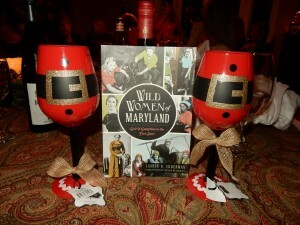 Women and Wine, it is all about good conversation and great wines to taste. And, dinner is usually served, as well. Once a month throughout the year they get together. 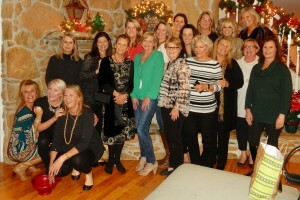 One person is the host, she provides the food, the rest bring what they would like to drink which is usually wine but there a few that prefer spirits at times. 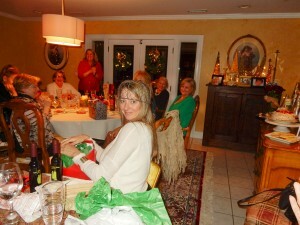 And, at this time of the year, Donna, gives a Swirl Girls Christmas Party. 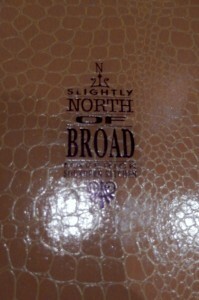 It is at this time that “members” can invite friends to attend. And, that is where I come into the picture. 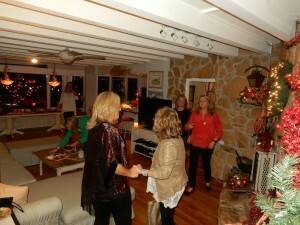 My friend, Cindi, invited me. 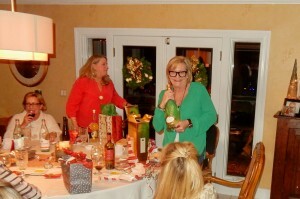 We were to only bring a present worth about $20 or so with an Italian theme. 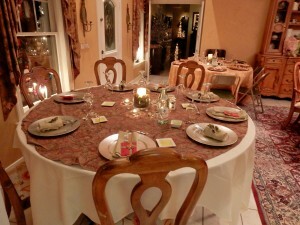 We arrived at Donna’s to find the house totally decorated, the tables set, and the Swirl Girls ready to mingle with friends. Nobody is posing for photos so what you see is what I got. Tasting wine is not the same as drinking it. You have to pay attention to those acute senses of sight, smell, touch and taste. A true Swirl Girl holds the stem of the wine glass, and gently swirls the glass in small circles on a flat surface, allowing the oxygen to penetrate the wine. You are aerating the wine. 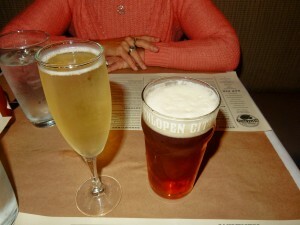 As the wine coats the sides of the glass, it releases its bouquet. 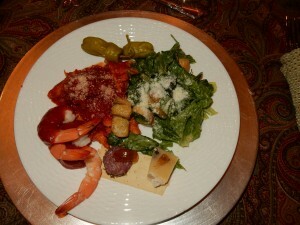 For dinner, we had pasta, Caesar Salad, shrimp, cheeses, breads and soups. 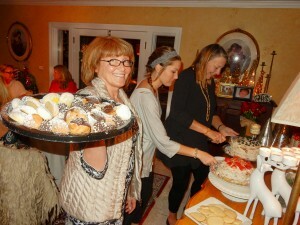 For dessert homemade cakes, cannoli and cookies. 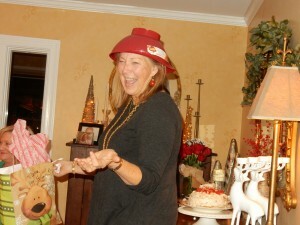 Then the Presents…..We all got one number. Everyone got a present. By the order of numbers, starting with number 1, this person opens her present, then the person with number 2 decides if she wants that present or she can open her own. In reality you can steal the other person’s present. And so the evening went. 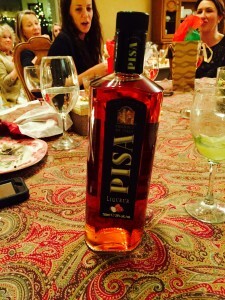 For example, I got this bottle of Italian Pisa Liquor and was immediately snatched by one of my “friends”. Others were able to show their presents so others could make a decision. The bottle of champagne was snatched too. 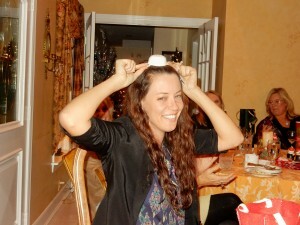 The next photos show some of them wearing colanders. There is a reason. 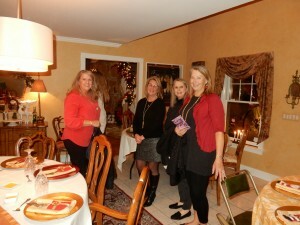 And, it is not that they had too much wine. 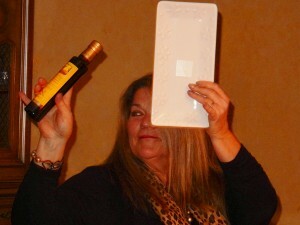 Did you read about the woman that wanted to wear a colander on her head on her license’s photo? They finally did let her. She is part of a “religion” called the Pastafarians. I am not making this up. You can research it yourself. So being politically correct, we decided that the theme would still be Italian and few colanders showed up during the evening. The greatest gift of life is that of friendship, and I have received it!! At times I don’t get to see them often enough, but when we get together is like time have stood still. Love it and I find it priceless!! 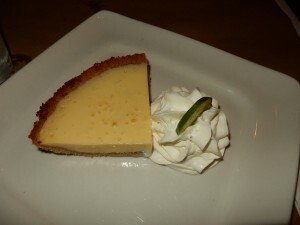 Eating my way through Charleston. A friend that reads my posts told me she was not going to read them anymore. She was gaining weight just looking at some of the food. 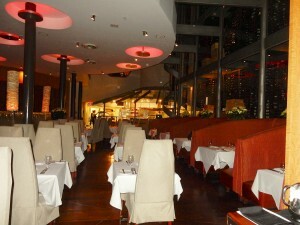 I arrived at Cypress which was across my hotel, The Vendue. 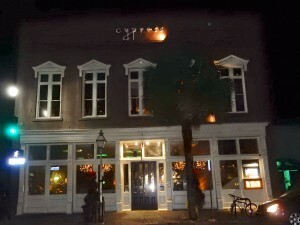 This is a historic building….but practically a lot of the buildings in downtown Charleston are historic. The location? 167 East Bay Street. Website? 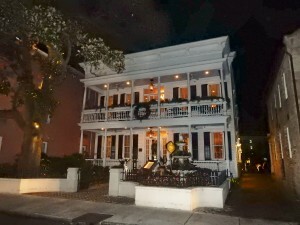 http://www.cypresscharleston.com. 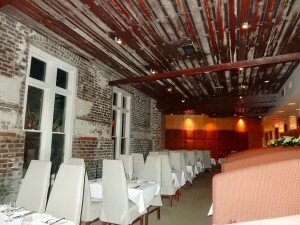 You may call for reservations at 843-727-0111. 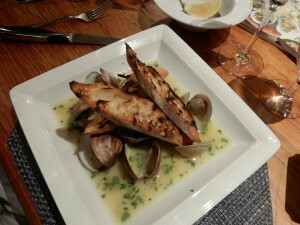 The Mezzanine Bar opens at 5:00 p.m. and the Dining Room opens at 5:30 p.m. You may also make reservations online. The above mentioned website is a wealth of information. You can also read about the chefs, and check out what events are going to be happening in 2016. They will be open on Christmas Eve and Christmas Day so please take a look in case you want to take advantage of a relaxing and delicious experience in dining. 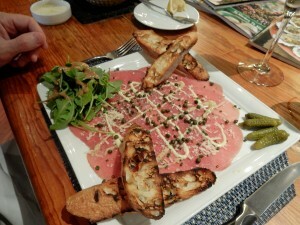 Cypress is part of a group of restaurants…Magnolias, Blossom, and Artisan Meat Share. 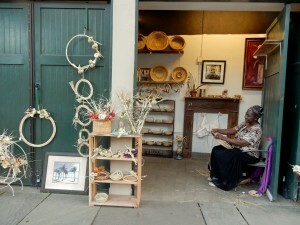 If you are visiting Charleston take a look at them, as well. Taylor was my server and I have to give a loud shout to her. 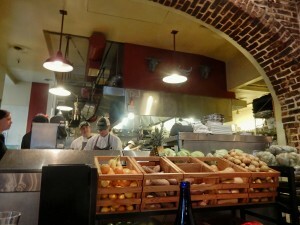 She knew the menu so well, having tasted most everything from the kitchen. I followed her advice and I could not have been happier. 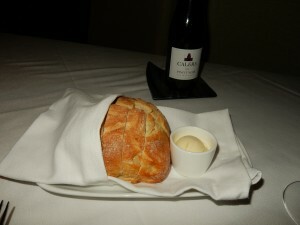 A little wine and warm bread to the table. Not just a simple bread….the crust was well done and the inside was just perfect and so warm. 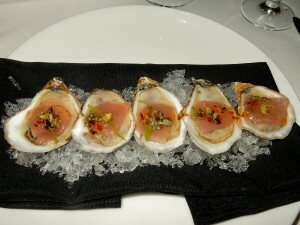 An appetizer of Sashimi Tuna & Oysters….what a great combination of flavors. Oysters are in season. It had a ginger-garlic glaze, and pineapple wasabi. 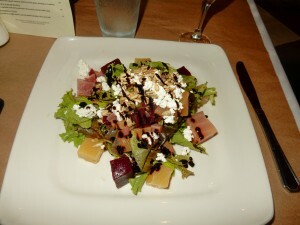 Not only did they tasted delicious, the presentation was awesome. For my entree I was looking at the Crisp Wasabi Tuna. 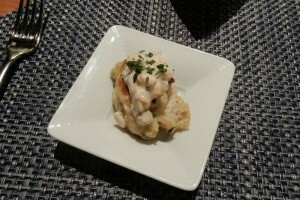 Taylor told me that it was a signature dish, and one that is usually photographed in the magazines. I had to have it because it sounded perfect. 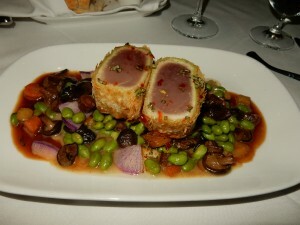 The tuna had a crispy outside placed on carrots, turnips, radishes, edamame, shiitake mushrooms, and that fab ginger-garlic glaze once again. I could not get enough of it. What could my sweet ending be? 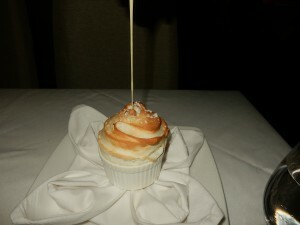 The Grand Marnier Souffle sounded decadent. It was brought to the table and when the Marnier creme anglaise was poured from above, I was just so happy to have had my camera ready!! 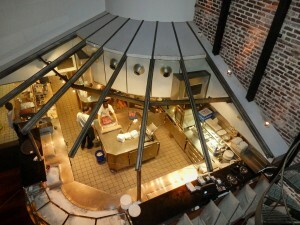 If dining or having drinks on the Mezzanine you will have an advantage bird’s eye view of the kitchen. Once again many thanks to Taylor for taking care of me. 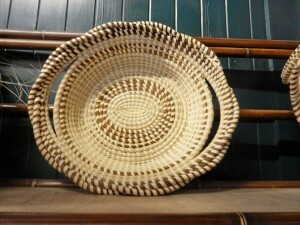 I thought that on this second trip to Charleston I was going to again leave without a sweetgrass basket. 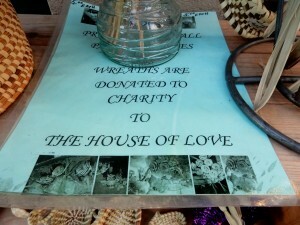 I don’t know, to tell you the truth as I was passing plenty of weavers, none hit it where it should have….my heart. Except, that on my last day I grabbed a cup of coffee and went down the street by my hotel, The Vendue, towards the Waterfront Park, which is on Vendue Range. The photo above is exactly what I first saw. 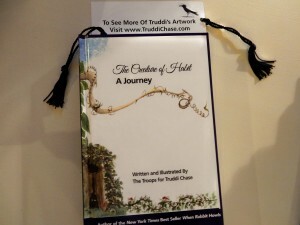 I have never met a stranger, so this time I stopped and engaged Trudy Hicks in conversation. 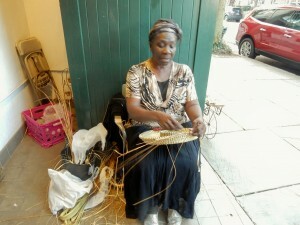 As it happened, Trudy is one of Charleston’s finest sweetgrass basket makers. She was taught as a child and she has passed this art form to her children, grandchildren and plenty of others that want to learn. Many years ago, before she took over for her grandmother, Trudy had her own hair salon. She has a great spot on this street because the previous mayor of the City of Charleston awarded her this particular station because of her connection to Boone Hall Plantation. Her grandmother is the last living person that lived at Boone Hall. Her aunt had been born there, as well. Once she is finished for the day all she has to do is close the doors. 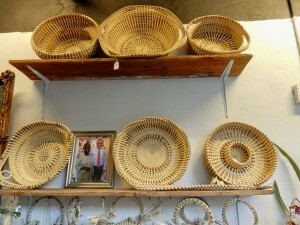 The basket weavers in the market have to take everything down every day and take it home. 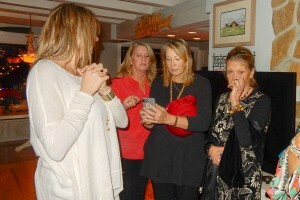 Trudy showed me photographs of her family. 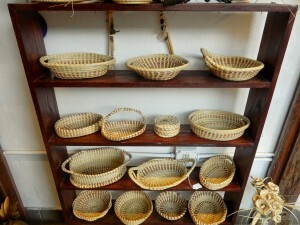 Also a photo of the first road stand in Mount Pleasant where the first baskets were weaved and sold. 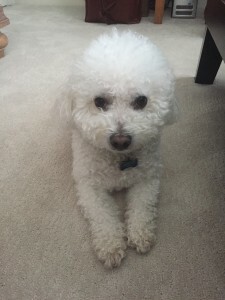 Trudy gives back to the community. 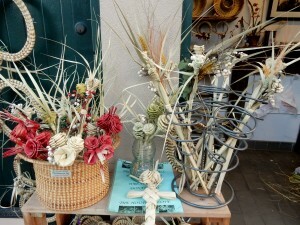 The flowers, wreaths, crosses made out of sweetgrass…proceeds go to The House Of Love. She takes children out on field days, and helps in every which way she can. 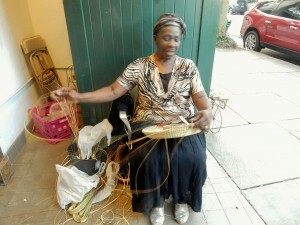 I think everyone in her family except one of the little ones know how to weave. She tells her daughter to get those little fingers ready!! 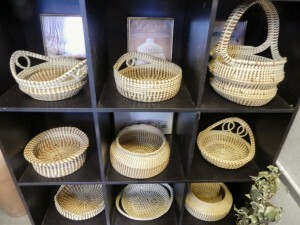 Sweet grass baskets are so easy to take care. 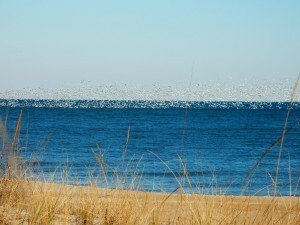 Since the grasses are from swamps and marsh areas, water will not hurt them. 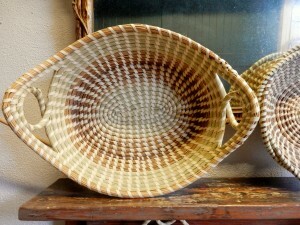 To clean, just spray the basket with cold water and then let them air dry. That’s it. Trudy’s telephone is 843-460-0901. She also ships. 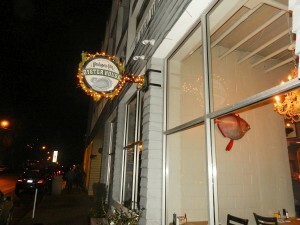 So, next time while visiting Charleston stop by and say hello. She will give you a warm smile and plenty of hugs and will really make your day, I promise you, she will. She is one awesome lady.